GameFly will launch a new digital client this holiday, the biggest benefit of which will be a new "Unlimited PC Play" service. It will allow subscribers to download and play any offered PC/Mac games, presenting a natural evolution of the service since it acquired IGN's Direct2Drive platform several months back. "We're talking to all publishers about participating. Several have been signed, but we're not announcing at this time," GameFly co-founder Sean Spector told Joystiq. "In the 'Unlimited PC Play' portion for GameFly subscribers, we expect to have over a hundred titles available for the beta launch, but we'll be adding to the list constantly and should have hundreds at the time of our holiday launch." Asked if the company would offer a PC-only GameFly subscription, similar to those found with movie rental streaming services, Spector said, "We currently have no plans to offer a digital only subscription, as we believe the real value to gamers and our members is our unique combination of console and digital PC game offerings." Spector tells us that, like the company's mobile apps, the client-based application should update regularly and customers will have access to whatever games they download as long as they maintain a subscription. GameFly will launch the closed beta for the client on September 8 at a Los Angeles event, where attendees will receive a beta code for themselves and a friend. GameFly subscribers not in the LA area can still sign up by heading over to the beta section of the site. 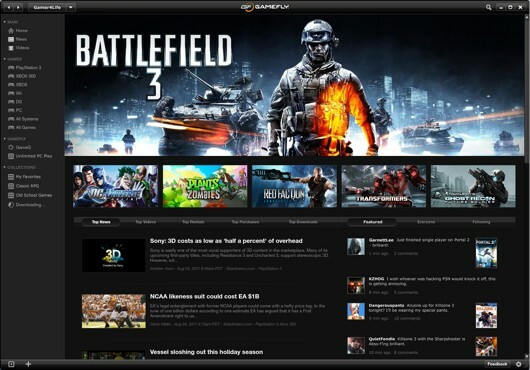 We'll have to wait and see how GameFly's Unlimited PC Play service will impact OnLive and the PlayPack. You train fleas by android phones cheap potting them in a jar with a top on it. Fleas jump.